William ("Billy") Vincent Starkel, a prominent Portland musician, was born November 3, 1914 in Portland. Billy's father, Henry Starkel, was born about 1890 in Grimm, Russia. Billy's mother, Christine Strecker, was born February 23, 1894 also in Grimm. Henry migrated to Portland in 1910 and married Christine on November 1, 1913. Billy Starkel. Photo source: The Oregonian. Henry was what Billy called an "old country" accordion player that played traditional Volga German music. Henry performed at weekend dances in a dance hall above Weimer's Hardware store on Union Avenue, much to the dismay of the religious community. Billy was quoted as saying, "It's a good thing I had already become interested in music, because I found out that, as the first son, I was expected to follow my father in music." Henry worked full-time as a machinist for the railroad and part-time as a musician. Nevertheless, he kept Billy busy with music. "We'd sometimes play in grange halls," Billy said, "and they'd only heat these halls up once in a while. The old piano would sit there in the cold for weeks and then they'd light up the big pot bellied stove and the piano would swell up. Then, my father would have to get bailing wire to help tune the piano so my mother could play it." Henry first taught Billy to play on the old button row accordion. Later, Billy would study under Jack Enzler, and in 1933, he went to San Francisco to continue his studies under the celebrated accordionist, Anthony Galla-Rini. Billy attended the Albina Homestead School and Benson Polytechnic High School. His family attended St. Paul's Evangelical and Reformed Church and he was confirmed at the Second German Congregational Church in 1929. He began his successful musical career at the early age of nine years. The earlier years were spent entertaining in the Pacific Northwest playing the accordion live on KEX radio and as one of the Journal Juniors, a group that put on talent shows on Saturdays. Billy's group performed at the dedication of Timberline Lodge on September 28, 1937 and they continued to perform there for many years. Billy also performed in the San Francisco area, where he appeared on stage as well as radio networks. 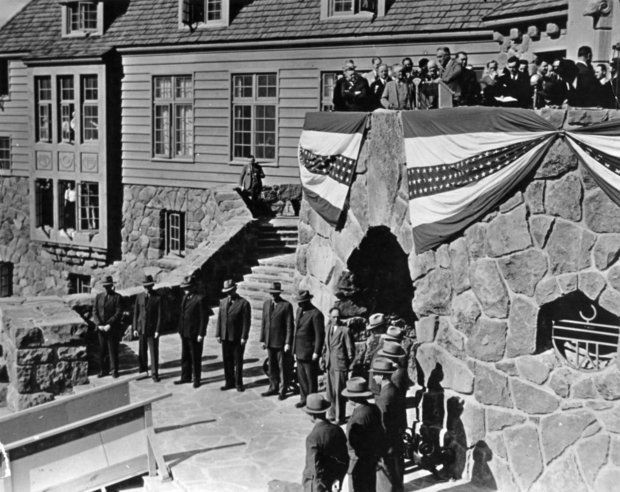 Dedication of Timberline Lodge by Franklin D. Roosevelt in 1937. In 1942, Billy joined the United States Marine Corps and served in the South Pacific. During the war, he entertained and played with other prominent musicians. After being discharged, Los Angeles became a new challenge, playing in such well-known hotels as the Ambassador, the Chapman Park, and the exquisite Hotel Bel-Air. Also, during part of his time, Billy was heard weekly on their own radio show the "Tone Portraits in Melody" from WNBC in Hollywood. Billy temporarily altered his surname to 'Star' and the show featured the Star Kings, a collaboration between Billy and violinist, Morris King. Billy moved to Las Vegas in 1950 and during his twelve and a half year sojourn there, he played in all the fabulous resort hotels. There was a short leave of absence for several months to play in Honolulu at the Moana-Surfrider and Royal Hawaiian hotels. Shortly after Billy's return to Portland in 1962, the Portland Hilton Hotel had its grand opening with Billy chosen as the Director of Music. Billy's orchestra played six nights each week for the members and guests of the Hilton's International Club. Billy also organized the "Magic Violins," a group of symphony violinists who performed for private parties. Billy retired in 1976. He was a life long member of four locals of the Musicians Union in Los Angeles, Las Vegas, Honolulu and Portland. Billy was an active member of the Oregon Chapter of the American Historical Society of Germans from Russia and organized the performing group know as "The Volga Warblers". The group was known for its Vaudeville style entertainment which delighted their audiences. The act was a mixture of Volga German, German and American elements. Billy Starkel died on January 19, 1988. Survivors included his wife Colleen, son Randolph, daughters: Cassandra Wynne, Cynthia Kasch and Christina Stoecker, and 10 grandchildren. A memorial service was held at Our Savior Lutheran Church in Portland, Oregon on Friday, January 22, 1988. Billy was interred at the Willamette National Cemetery in Portland. I'd like to share some short stories about my father, Billy Starkel, in his early years. Billy and his father Henry played at grange halls on weekends. Some halls had pianos which were terribly out of tune. One Friday, Henry was trying to tune an old upright and told Billy to give him an A note. As Billy played the A, Henry tightened the wire more and more. All of a sudden the wire broke, whipped around, and stuck through Billy's cheek into his tongue. Henry saw this and pulled the wire out. He reached into his back pocket and brought out a handkerchief. Henry used the handkerchief to wipe off the blood, turned back to the piano and said "give me an A." Henry was convinced that Billy had true talent. A famous accordion teacher made trips to the Portland area each week to teach other students. On a Friday, Henry told Billy to pack up his accordion. They took the bus downtown to the teachers studio. When they arrived Henry was told that the teacher was booked solid and could not accept any more students. Being a stubborn German, Henry sat in the outer office until the teacher was done for the day. Henry asked the teacher to listen to Billy even if he could not be a student. Billy played and the teacher rescheduled his time so that Billy could play, practice and undergo training every Saturday morning. Talk about the Volga Germans being resourceful, Billy often put the cap on it. Billy was in a Marine reserve unit awaiting orders to attack one of the South Pacific Islands. He had his accordion with him and often played for his buddies. A young officer heard him and asked if Billy would play for the officers at their makeshift 'O' Club. Billy said he would and entertained the officers all that night. The next day the young officer stopped by and thanked Billy for the entertainment and asked if there was anything he could do for him. It was that time of the month when each man received his ration of beer. Even warm beer is better than no beer. Billy asked the officer, a Marine pilot, if he could load a couple of cases of beer in his plane and chill it down during training flights. The officer said that he could. Billy Starkel was the only Marine on that entire island who had ice cold beer. Billy was transferred to the Merry Men of the Marines, a group of professional musicians under the direction of Bob Crosby. They played up and down the West Coast for Marines being shipped out. At MCRD San Diego Billy was doing a solo. As he played he heard laughter from the audience. The Merry Men were also great practical jokers and Billy thought that he was the target. He continued to play and the laughter got louder. He looked left and right but saw nothing. He felt his fly thinking that it was open. All to no avail. Finally the laughter got to be too much and for the first time Billy stopped right in the middle of a tune. He looked all around and finally looked down at a 1 1/2 year old baby standing right next to him. He picked me up and put me on top of the accordion, walked to the microphone, and said for all to hear "This is my son." That little act brought the house down and after the tune I was promptly returned to the waiting arms of my mother. Album cover of Dance Portraits in Melody produced by Spiral Records, Inc., 4406 NE 92nd Portland, Oregon 97220. "Portland musician Billy Starkel dies; career included radio, hotel bands." The Oregonian [Portland], Thursday January 21, 1988, pg. E5. "Gun-music trade pleases Starkel." The Oregonian [Portland], Wednesday February 5, 1975, pg. A15.